Fun from head to tail, it features your pet and a poem celebrating the special gift that is a rescue. 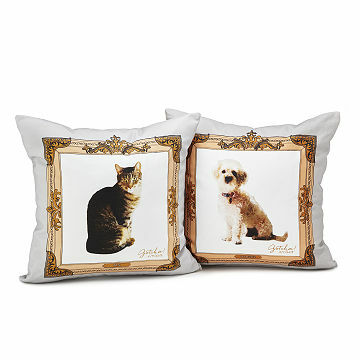 Your four-legged family member reigns over the house, and this regal personalized pillow proves it. Fun from head to tail, it has a photo of your pet on one side and an ode to rescues on the other. Our favorite detail: the "Gotcha!" date in the corner, because we can't imagine life without our forever furball. Poems by Martin Geller. Made from cotton in Brooklyn, New York. $5 from your purchase goes to Rescue City, a rescue, rehabilitation, and adoption non-profit in the New York City area. Click to read the poems. Also check out our Rescue Pet Dish Towel. Cover can be cleaned machine wash cold inside out; hang dry.